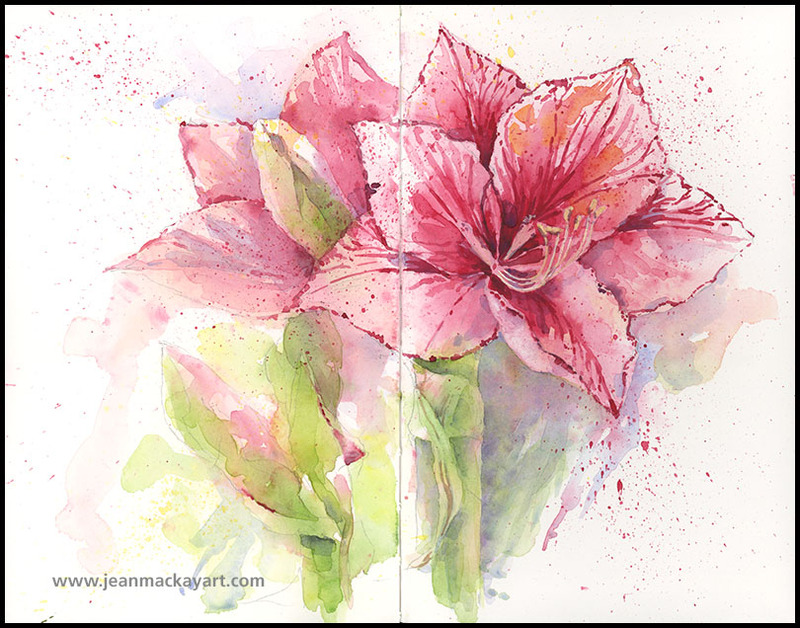 This entry was posted in Journal, Watercolor and tagged amaryllis, garden & flowers, ink and watercolor, negative painting, sketchbook by Jean Mackay / Drawn In. Bookmark the permalink. Jean, I love how you show the contrast of these 2 techniques. I strive to paint in a looser style but detail is what I seem to enjoy. Me too. It’s taken me a long time to loosen up, but I still enjoy the details of a tight drawing. Stunning, Jean. Thank you for describing your two different approaches. Hi Cheryl- Thanks. I’m glad I had a chance to approach it both ways. I did the initial bulb painting with a more detailed approach too and wanted to mirror that. But the flowers just seemed way too outrageous to render them tightly. Especially the looseness of the second one. Your example is inspiring. I like what you shared in words and pictures. Thanks Janet! Congrats on your book!! What an accomplishment. Ah, but together they sing! They are complete!! I do like seeing them together. They both work in their own ways. This is gorgeous, Jean! 😍 And thanks so much for sharing a bit of your process and approach! Thanks Charlie- Did I just see that you published a book? 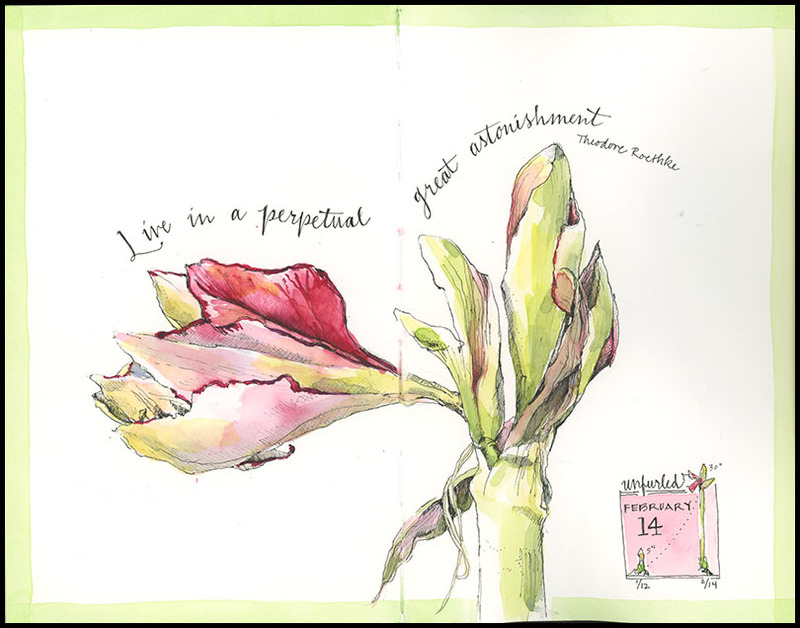 Congrats on your many successes with Doodlewash. Aww thanks, Jean! 😃💕 Well, self-published a little illustrated cookbook that Philippe and I made. It was a fun project and turned out great! Jean these are two beauties. I really loved your use of loose water color in the back round to create the canvas in which the blossom pops! I realize too, that I enjoy like seeing the pen/pencil lines of the artists work. Thanks for the breath of fresh air! Thanks much. I like seeing those pencil lines too. ours did just the same thing. That’ll be four years in a row. I’ve asked my aunt to stop buying them for me as it depresses me every time they fall and break their neck. Poor flower. That is sad, but beautiful work. Thanks Anna. I like that one too. Thanks Nidhi– glad you are following! I just love the opening sentences to this post! Your work and your words are inspiring.